When is a postmark not a postmark? When Royal Mail wanto to make it exclusive, apparently. Readers who are interested in the special stamp programme and/or Pink Floyd in general will recall that one of the special products aimed not at stamp collectors but Pink Floyd fans is a special cover depicting Syd Barrett. "Royal Mail only applies postmarks to genuine items of mail. This means that any item submitted for postmarking should conform in all respects with postal service conditions: it should be addressed and bear at least an amount of postage appropriate to the postal service being provided." "Special Handstamps, which are sometimes referred to as Special Postmarks, normally incorporate a pictorial design, and are used to mark particular events and anniversaries .... Customers may post covers [to the Special Handstamp Centres] for handstamping ... Care should be taken to ensure that it is made clear which handstamp is required. This can be done by marking on the outer envelope which contains your covers .... the reference number. " The guide also states that all special handstamps - originating in Royal Mail or sponsored by an organisation, company, or dealer will be publicised in the Postmark Bulletin and, by implication (this isn't specifically stated, will be applied to any suitable item of post which is sent to the SHC by anybody, ie it is not exclusive to the sponsor. 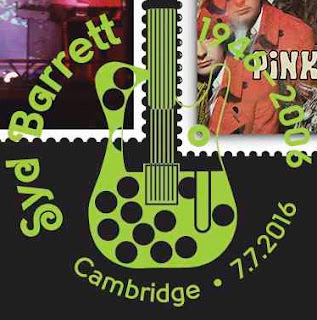 So step forward Royal Mail and Syd Barrett: anybody who thought that they might be able to service their own covers or cards with a Pink Floyd (or any other) stamp and have this 7 July 2016 Cambridge postmark applied to it is likely to be disappointed. I have been told that this will NOT appear in the Postmark Bulletin and will only be used to cancel the special Royal Mail Syd Barrett cover. I'm sure somebody, maybe a member of the British Postmark Society, will tell me that this has happened before. I'm getting too old to remember past infractions, but this will be yet another Royal Mail disappointment for some people. This may be a technical argument, but if this handstamp is not advertised in the Bulletin for general use and it is not an operational (inkjet) mark, surely it's just a cachet applied on a private basis by Royal Mail, and the cover is not a first day (or any other type of commemorative) cover. Anyone could do the same, which makes it worthless as a collectible item. Which takes us to the "here's one I prepared earlier" department. 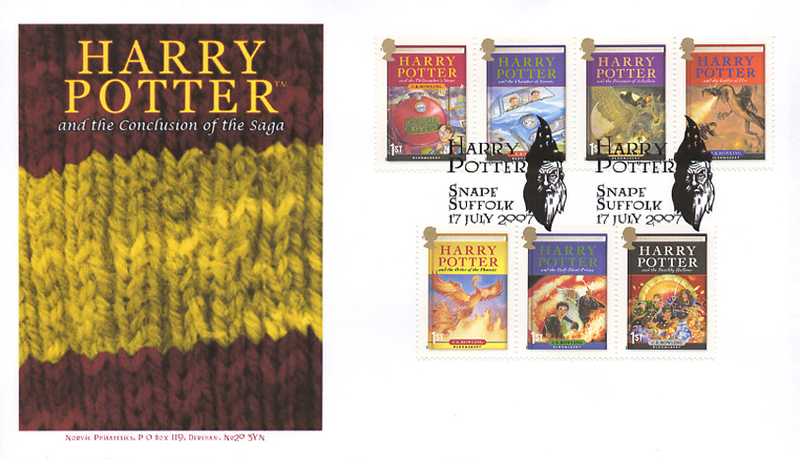 I was prepared to sponsor a postmark for the Harry Potter stamps issued in 2007. However, because I was using my own (clipart) artwork depicting a (generic) wizard, and not the Warner Brothers provided artwork (which were mostly woodcuts and, quite frankly, dire) Royal Mail would not accept my money, and this postmark did not go ahead. I think it made a very good cover, though! Norvic FDCs with real postmarks here! I've just been told the same. So I am one of the disappointed. As far as I know this has never happened before. It is just another tiny nail in the coffin of my hobby. The first time I have not been able to submit the cover I want with the stamps I want. For years RM/Royal Mint have produced covers with either a set of stamps or mini sheet on a coin cover and I have produced a RM cover with the other stamps for the same handstamp, never a problem. The obvious next stage is to allow handstamp sponsors to refuse to allow others to submit covers. Then refuse to allow individual collectors to submit covers at all. Then all FDC collectors can pack up and not buy any more stamps. I wonder if the colour of the ink is the limiting factor. "Sponsors of special handstamps may, for an additional fee, have the handstamps on their own covers applied in coloured inks. Unless otherwise stated in this Bulletin, covers sent in under the reposting service will have the postmarks applied in black ink. Indication of the use of any coloured inks will be given and readers interested in acquiring covers bearing these coloured postmarks should contact the sponsor for further information." "Anonymous" (below) is correct. There have been many occasions when the sponsor chose red, or gold, and we all had to have black. There were even occasions when RM chose a colour and said all handstamps would use that colour (due to the colour of the stamps) but that didn't always happen. But in this case the 'sponsor' is Royal Mail. On the other hand in 2004 they wanted to do the Woodland Animals in silver and I asked for my maximum cards to be done in black - and most were. There has always been a restriction based on the ink colour, so that the sponsor could restrict the coloured ink version to their own covers. Why aren't RM simply doing that - restrict the lurid green version of the handstand to their own covers, but allow the rest of us to have use of the handstamp in black. I can't understand RM's death of a thousand cuts for FDC collectors. If they think collectors using Handstamp Centers are more trouble than we are worth then remove the facility. We will go away if they continue to make life difficult. My £10:80 worth of stamps which were going on covers with this H/S are now in the "postage box" so effectively lost to RM.